The NABs authoritative new book by Allison Dollar contains a wealth of useful information and insight on the status and future of interactive TV. Included is some discussion of coactive TV and how this unconventional perspective suggests some important directions for the future. That material is based on interviews with Richard Reisman in October 2002. Reisman also notes that the PC-based media servers, alluded to in previous chapters, spurred by broadband deployment and services are extending themselves into the television environment. Likewise television organizations ought to move toward the Web... For better or worse, the future of the TV and PC remains linked. Richard Reisman is right: the business opportunity ahead lies in exploiting that link. The rollout of interactive television in the U.S. is inevitable. 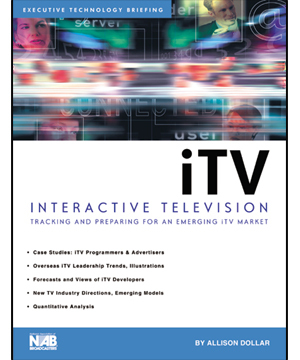 iTV: Interactive TV tracks media trends and technology developments in the U.S. and Europe. Interactive services, programming and advertising will transform today's $60B television advertising business by stimulating further growth and multiplying revenues many times over. Empirical evidence from iTV trends, case studies and overseas developments all point toward an iTV future with a far-reaching, lucrative impact on the U.S. media business. iTV profits will come from two sources - consumers and advertisers. Keys for media industry stakeholders lie in flexible business models and development of the sophisticated metrics systems advertisers require. Successful iTV developers will be those actively exploiting cross-platform distribution of iTV content, coupled with creative programming, marketing, advertiser packaging. iTV is a totally new media environment with challenges on many fronts. Technology, legal, political, social, creative and cultural issues have slowed deployment to date. Long-term, iTV profits will not come from "new" television business models but from adaptable re-combinations and/or hybrids of existing models/ forms found in the current media market such as Advertising, Sponsorship, Pay-Per-View and Subscription. iTV will transform these basic models into advanced Transactional and Direct Response tools for more precise targeting and consumer marketing. Eventual iTV winners will be companies fully exploiting cross-platform distribution and fostering cooperation between programmers, marketers and advertisers. Easier said than done, but to flourish going forward media companies don't have any other choice - iTV is the future. Coactive media: Relating to media multitasking. The simultaneous or alternating use of two or more media, such as TV and Internet (Web, etc. ), especially where the using of the media is synchronized or coordinated  typically (but not necessarily) on multiple devices or screens. Coactive TV: Relating to multitasking use of both television and the Internet (Web, etc.). The simultaneous or alternating use of TV and the Internet, especially where the using of both media is coordinated or synchronized, and especially where the TV and the Internet browser are automatically coordinated with one another  typically (but not necessarily) on multiple devices or screens.